We all love pure white freshly fallen snow, unmarred by footprints, ablaze with highlights. I always loved waking up in the middle of the night when it was pitch black outside and I could see the big fat flakes tumbling over each other in the glare of the streetlight. I would punch down my pillow so I could lay halfway in the corner of the window, alternately looking up into the light and down at the pane as slowly and steadily the light flakes piled higher. If there hadn't a storm window in place, I would have reached out to gather them on my finger tip and tongue. The next day I had a stiff neck and in two days all that pure whiteness turned to snit, as Kelly Ripa would say, but oh how wonderful were those magical moments of pure fresh snow. I've spent all of my adult years living in a place where it doesn't snow, but I have those childhood memories ~ and loads of SU's Dazzling Diamonds glitter! But that's not why you called. Welcome to the first day of December!! You've got about ten days to finish your cards if you have any hope of them reaching their destination by the 25th, especially those far-away destinations. But before you go, I have a coupla snowy cards to show you. I'm telling you, another good thing about making QACAS cards, besides ease of mailing, is that it doesn't take long to describe the process and the ingredients! The two bunnies flying through the fresh snow on my card were made from a NBUS image in the "Winter Wonderland" Penny Black set. They were black heat-embossed, Ziggified, and winked proficiently by the little Hammy, who now has permanent glossy nails and loves them! The sediment is from the "Full of Merriment" set, also by Penny Black. You can't get much more uber QACAS than this and who doesn't love white-on-white or, as I like to call it, W-O-W. The card base is embossed with a brick e/f. The beautiful snowflake ornament is "Snowflakes and Ornament" by Hero Arts (D1528 Fancy Die). Thank you, Lisa, for the information! I simply added a gold glitter-embossed brad that I've also had since ... well, I'm so long in the tooth, I can't remember when I got them. The simple sediment was gold-glitter embossed. Simon Says Stamp Wednesday: Anything goes. 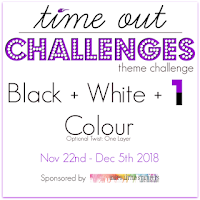 TIME Out: Black, white, and one other color. Hi Darnell, I like to see the snow, but not keen on being out in it once it has been trodden down and is slippery. Fab cards. The second one is so elegant. I LOVE to look out on snow too, particularly fresh snow but (these days) I HATE to have to go out in it! FAB makes both but you've just reminded me that I too have the PB Winter Wonderland and have yet to use it to it's full potential - I feel a Christmas card coming on! Love your falling snow video and your childhood memory snippet. Great white card too. Thanks for playing at AAA Cards. I love seeing the snow too Darnell although that's not very often here in the UK, it never stays very long here either. I'm loving your CAS cards and still have a few to finish so I'll have to see what I can come up with. Hello Darnell... Oh your post took me back to childhood days watching the snow through the window but you know we always had icicles inside in those days too! I love the silence of snowfall... It seems to soundproof everything but then as you quite rightly say... It soon turns. It is very, very rare we get snow down her in Louisiana where I live. I have to say it is pretty when it comes down. Love your cards! Cute bunnies in your first card and WOW I love, love your second card! 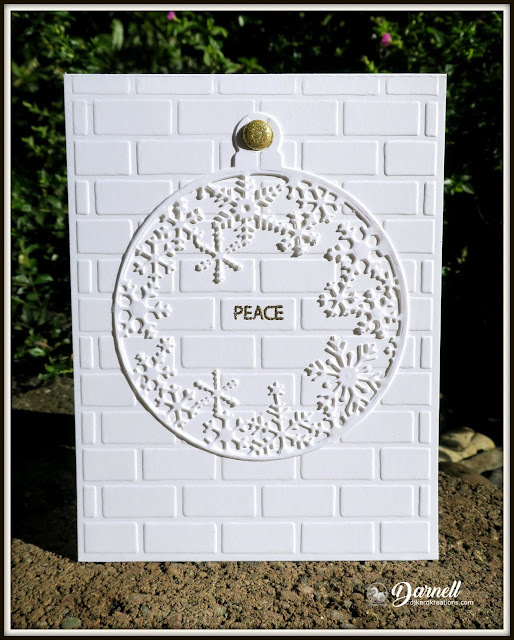 Love the embossed brick background and your snowflake ornament is gorgeous! What a lovely memory, Darnell. I grew up where it doesn't snow and now live where it does. My nearsighted eyes don't let me see much from bed, but I've been known to jump out of bed to grab my glasses and peer out the window to watch the loveliness you described! Your cards are beautiful. That first one makes me grin in delight and the second is very elegant. That die reminds me of The Memory Box style of dies. Hope you can find it. :) Happy weekend! In the meantime, I adore your snow bunnies! and pure white magic! 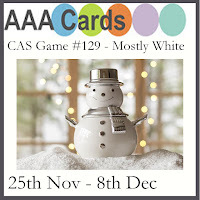 Great snow/white cards! Love those little bunnies! Enjoy the weekend! I like snow only when I can sit inside in front of the fireplace with a book--or even better in my little retreat crafting. Those bunnies are so adorable. I can just hear them giggling as they romp around. That snowflake circle die is beautiful. I love those bunnies. What Bunny wouldn't? Great WoW card, too. When I was little I used to look out the window at the snow too. Except in Florida we call it rain and we're going to get slammed today. I would have loved the snow when I was young. I wouldn't like living in it. I still want to see it now and play in it. Oh what fun it always looks like. Then you mentioned "snit". I wouldn't like snit. Cas has to be good for Christmas cards with the ease of posting as you say. These two bunnies sliding on holly leaves are so cute. Well, I have just about finished my cards but now need to start all the writing of said cards. Love the cute bunny card and also pretty the white on white card. Snow definitely doesn't have the appeal now that it did when I was a kid. My feeling is that every day without snow is one day closer to spring. Enjoy your day! Feel free to stop by here if you want to see snow! Although today it is supposed to rain. Love the bunnies but that white on white is so elegant! 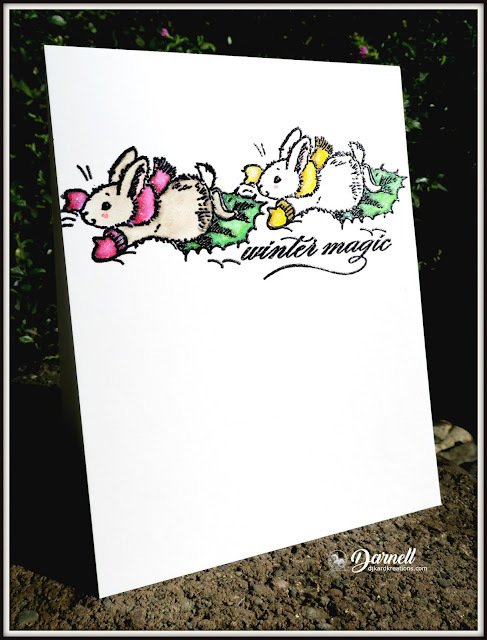 Hi Darnell, what gorgeous card, the bunnies playing in the snow is just delightful and the wow bauble is stunning. Wow!! Two ADORABLE cards! Those bunnies make me smile, how cute!!! And the sentiment is just perfect for their playing! The bauble on the wall is so brilliant and impressive!! Love very much this card, it seems remember peace to the world! The gold sparkling brad is just the perfect detail! Amazing diecut and embossed panel! Easy to explain QACAS is yet another reason to love them, and I do love these cards. One cute, one beautiful. You've got a gift, Darnell! I, too, have lived where it snowed a lot and it was so lovely and magical as a kid. These days I can only dream about being snowed in with hot chocolate and stamping and a cozy fire in the pellet stove, sigh... It's probably not as wonderful in grown up real life. Sure would be a nice change from all this rain, though! Love your fabulous cards Darnell! And yes, I adore freshly falling snow. I hope we get to see some this year. It's hit or miss in my area. Because I know who you are, I'll just bet all your cards are done, enveloped and stamped. Wish I could say the same but no, that would be a lie. These two are sure to make some recipient very happy. Oh man...these are delightful. I need to get moving I need at least 30 more...I am afraid to count what I do have...lol. You are spot on with the thrill of the lovely fresh snow but you really made me laugh with the stiff neck. They (whoever they are) do say that no pleasure comes without pain. Two fabulous cards, especially love the second one with that super snowflake die. Two stonkers. Those bunnies sure know how to play tag. Love the wreath card. That awful elf is back , for good this time. Hugs Mrs A. Your memories of the snow falling bring back cozy memories of watching the snow fall in the light of the streetlight or the spotlight on the edge of the house. I'm looking froward to seeing some snow and I love that I'm seeing it on your card! A beautiful die and the simple gold accents make it so classy! And your little guys sledding across the card on their holly leaf sleds is adorable! Hi Darnell! I’m the same about looking at snow out the window! It might snow here in north Texas maybe 2 or 3 times and even if it’s in the middle of the night I’ll grab my glasses and find that street light to se it coming down! We get so excited about the snow! LOL! Love both of your cards! I really admire how you created the bunny CAS card—I just can’t stop myself from adding more schtuff. Haha! Love, love all the texture on the WOW card. The snowflake die is beautiful! Many hugs! Oh Darnell what a fabulous memory - I have hardly ever seen snow falling, never mind living in it when it turns to snit!! We have finally got some sunshine today!! Love your bunnies, and so well winked by Hammy - and I am sure he looks so elegant with schmarkly nails!! Your W-O-W card is just that too - love the wee touches of gold. Hmmm...it's snowing here, as I type. I am looking out the window and see the flakes in the streetlight. It's pretty...but only for a couple of hours. Then it's a pain to shovel and drive in. I wish I could share some of it with you so we didn't have so much of it! Love love love the bunny card - CAS it is - and cute as well. The white on white is beautiful- that was my pick for this year as well. I am going to FINISH my cards this afternoon as hubby watches football - got everythingcut now to put together. BEAUTIFUL cards, and beautiful snow! We don't get much of that in NC, but when we do, it takes a while for both snow plows to get through the whole town to clear it. lol I'm working on Christmas cards, too, but I still have a lot to do so mine might be a little late getting to you. What a lovely pair of cards Darnell and it's always great to get a twofer on my visits. The first one is so cute and cheery and the second one has that touch of simple elegance. Both gorgeous! Fun first CAS card and the winky is glorious and so is the stamped images x. The texture on your second card is glorious and what a delicate and very pretty die cut from Linda. Yes would love to know who made it x. Thank you for the enjoyable post and enjoy your week x. Happy December Darnell ..... I love your snowy creations. Those little mice are so cute and beautifully coloured. We don't get that much snow here, and if we do it doesn't last very long. Two beautiful QACAS cards Dolly! Exactly what you need to make this time of year now that the crunch is on. I have all my cards made, but not written. I keep putting it off. Soon it will be too late for them to be on time, so I'm committing myself (Gord says he should have done that a long time ago!) to working on them tonight. At least I need to have the overseas cards ready to go for tomorrow. I also love to look out at night when it's snowing. Have you noticed how quiet it gets with the snow ... even if it's during the day. It's so peaceful. And fresh snow is pure white and the most CAS our landscapes can be. I think that's why I love snow ... or is that why I love CAS. Which came first, the chicken or the egg? :) Love, Lolly! Cute bunny card, but I really love the gorgeous white on white! Happy Holidays, Darnell! I think we have a winner for the sketch!! That card is GENIUS!! I love the fun little bunnies and the way you colored them in!! The second card is so pretty with the monochromatic look. I love the touch of gold!! You are rocking it!! Those bunnies are precious and your frosty white card is simply dreamy! Love the story you shared with us. I can just image you as a little girl eyes full of wonder at the falling snow...so sweet! I love those adorable little bunnies! And even more, I love the white snowflake wreath on the white brick wall - wonderful CAS! Oh, I love snow too, though we don't have as much as in the past. So sad as one of the advantages of old age and having a chance to be retired is we can now stay at home and just look out the window--no worries about driving to work! Adore your bunnies with their brightly colored mittens and scarves. And the WOW card is so elegant and beautiful! I so love watching the snow- so beautiful...then the aftermath : ) Loving your sweet bunnies, but really love your white on white card! Fun and creative cards! Your childhood memories are priceless. I have to smile when I saw your bunnies in the winter wonder land. They are so sweet! 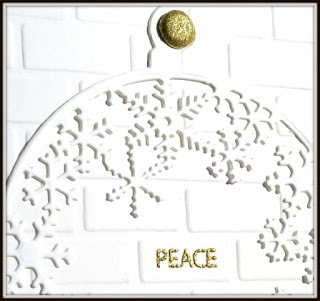 The W-O-W card is so elegant with the gold embossed "peace". 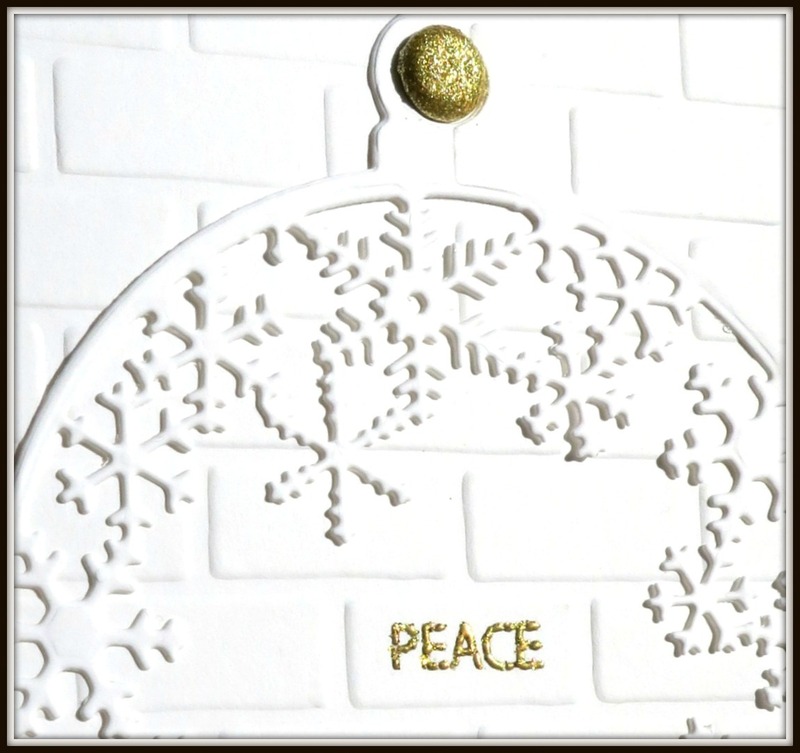 Love your white on white ornament card. So simple but so beautiful. That looks like the "SNOWFLAKES AND ORNAMENT" (Hero Arts DI528 Fancy Die). I have it but have not yet used it. Thanks for the inspiration! And, your mice are adorable! Wow all sorts of new acronyms QACAS and WOW!! you are surely a word smith and a source of joy in Blogland!! NOT to mention a brilliant card maker : ) These creations are fantabulous! Love those sweet bunnies and how clever to use them on a Christmas card. I would never have thought of that. The white on white is so beautiful. The image of snow falling is lovely. I like to look out when the snow is clean and the world is covered. It's a shame we have to dirty it up. Oh, the snow storms in the mid-West never leave the mind! Cold, sub-zero winds, tiny hard snow dots pelting us or the drifting of large, fluffy flakes, all treasured memories of the past. I now live where it mostly rains in the winter, rarely snows. Your bunnies are silly flying through that snow and the snowy ornament elegant in its simplicity. You're a wonder woman of ideas and talent. Thankyou soooo much for the lovely card that has arrived but I couldn't possibly dismanticate it in any way. The envelope however is now in shreds and been put to good use. Any bits left over will go as manure for the next crop of magic beans. That elf is driving me nuts along with the three ducks that have taken up residence on my pond and water barrel. Hugs Anne. What a treat to have you with us Darnell - twice! I love snow - and I do live in a place where we get it... I think there is nothing more beautiful and peaceful than falling snow. Especially if I have soup making ingredients and plenty of wine! I love both cards... the sliding mice are adorable. Love that snowflake die against the brick background with that wonderful touch of gold. It is always a joy to have you with us at Time Out! I also love to watch the snowflakes swirling down in the light of a street lamp. Love me a good snow storm but only if I don't have to go anywhere... It's snowing here right now! 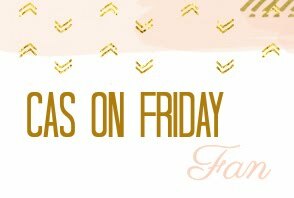 Your QACAS cards are fun and pretty! Adore the bunnies and your W.O.W. card is just that: WOW! I also love watching snowfall and this feeling of calm and peace. I love when the white mantel of snow is still without any footsteps only those of the different critters, but I've never seen yet bunnies flying through the fresh snow ! I would love to, they are so cute ! I should put a scarf and mittens to my cat, may be he would fly instead of jumping ! Seriously it is a lovely CAS and one layer card ! Love all the gorgeous white panel with these adorable touches of colours ! Thanks so much for sharing and for playing along at Less is More. Your W-O-W card is just that, Darnell. Such gorgeous cards. Love the second one! Both are great cards, with those cute little mice and that beautiful ornament but that second just WORKS! Beautiful, intricate and on that perfect brick background -- and W-O-W! Wonderful cards and that ornament is so gorgeous. How I missed this post I don't know, but sure glad Lisa made a mention of it so I could see these beauties too. I still have company so I am not into doing any cards at the moment.